Observers knew the pickings would be limited at this year’s PMA. 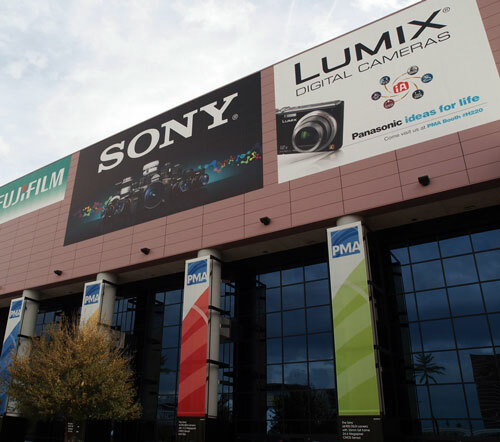 After the rush of announcements at last fall’s Photokina there wasn’t too much left for PMA some 5 months later. However, the actual announcements turned out to be even thinner than anyone expected. Notable no-shows were the Canon replacement for the $8000 Professional 1Ds Mark III, which Canon says has a sensor outperformed by the sensor in the $2700 5D Mark II, and Sony’s replacement for the A700, rumored to be called the A800. Both were expected at PMA and their absence started their own buzz among show-goers. These are tough economic times around the world, and even the robust interchangeable lens digital camera market is seeing sales declines in the last few months. This is obviously having an impact on camera sales, and manufacturers are more cautious in the costly development of new models. The one area where new models were not lacking is in the Olympus/Panasonic four-thirds sensor cameras. The only two new interchangeable lens cameras were both 4/3 sensor – although the Olympus E-620 represents the continuing evolution of the Olympus 4/3 line, and the Panasonic GH1 represents the High Definition Video promise of the micro 4/3 line. In my MFT lens guide I'll reveal the best lenses for Panasonic and Olympus mirrorless cameras! There are currently 3 Micro four-thirds lenses and all three have optical imaging stabilization with Mega O.I.S. In addition to the 14-140mm HD kit lens for the GH1, there is the $349 MSRP 45-200mm OIS and the G1 kit lens 14-45 OIS. Many more Micro 4/3 lenses are planned. Four-thirds lenses from Olympus, Leica, Panasonic and Sigma will work on the micro four-thirds mount with an adapter. Some fully support contrast detect AF and some do not. You can see a complete list of 4/3 lenses at Olympus. The Panasonic DMW-MA1 micro 4/3 adapter is available for around $169 at Amazon and other vendors. I have seen it advertised as low as $104. One of the lenses that works perfectly with the adapter on micro 4/3 is the Leica 25mm f/1.4. I also have used the micro 4/3 mount 45-200mm, which is equivalent to a 90-400mm 35mm lens and it is very good quality with useful image stabilization. "Some fully support contrast detect AF and some do not." Yeah, most of them don't. However, the good news is this: Panasonic is on the ball here. With how on top of things they have been with their camera line up, they are clearly very focused on their imaging division at the corporate level. Quote: "However, in a very un-entry move, the 5 center AF points are all double-cross – sensitive to both horizontal and vertical. The entry competition has at best one center cross-point..."
The Canon competition has this as well, so now there are 2 manufactures with 7 (or Canon 9) crosssensitive autofocus points in the upper prosumersegment. Both the Canon EOS 40D and the 50D has a 9 point crosssensitive AF. The E-620 is entry, not upper prosumer, and nothing from Canon or Nikon in the entry area (XSi, XS, D60) has multiple AF cross-points that I am aware of. The XSi/XS has 9/7 AF points with only the center as double-cross. The D60 has 3 points and I don't think any of them are cross-point though the center one may be. I believe he was replying to the inaccurate statement made by a previous poster. And since HE would be the person reviewing the camera for DT (he he is able to get a review sample) he would probably be the one who is most knowledgable and reliable about its performance if/when it's reviewed.